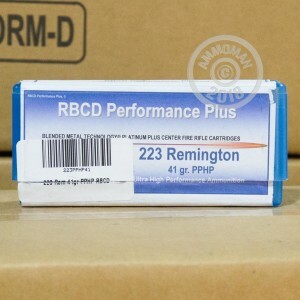 This Texas based, Arkansas distributed ammo company, RBCD Performance Plus, produces blended-metal bullets. However, this is more of a trademark, as blended-metal bullets are not currently available to the public. These bullets do travel much faster than normal rounds though and are covered in black moly, distinguishing them from other bullets. 223 Remington is a common round used for the AR-15 and is normally exchangeable with the pricier 5.56x45mm. This lightweight 41 grain PPHP round high higher velocities and is perfect for target shooting and varmint hunting.